Recently a GluR23Y peptide that contains the tyrosine-based signal (869YKEGYNVYG877) required for regulated AMPAR endocytosis has been developed. When delivered into neurons, the GluR23Y peptide blocks electrically induced LTD in hippocampal slices30. Because of its strict sequence requirement, the peptide shows unprecedented specificity, being able to block the expression of LTD without altering AMPAR function and basal synaptic transmission. To facilitate the intracellular delivery of the peptide, both the wild-type GluR23Y peptide and inactive control GluR23A peptide were fused to the cell-membrane transduction domain of the human immunodeficiency virus-type 1 Tat protein (YGRKKRRQRRR; ref. 30) to generate Tat-GluR23Y and Tat-GluR23A using previously published methods34. Tat-GluR23Y was transduced into neurons and blocked NMDA-induced AMPAR endocytosis in a neuronal cultured model of LTD35. Fluorescently tagged Tat-GluR23Y peptide can cross the blood-brain barrier and reach the cortex of the brain after systemic administration (Figure 32.3). The potential role of NAc LTD in mediating the expression of behavioral sensitization to psychostimulant drugs was examined using the recently developed Tat-GluR23Y and Tat-GluR23A peptides. Persistent depression of cortical glutamatergic inputs to medium spiny neurons can be induced in the NAc36 (Figure 32.4A) that is similar to a form of hippocampal LTD mediated by facilitated endocytosis of postsynaptic AMPARs3,37,38. Several interference peptides for AMPAR endocytosis were delivered to in the postsynaptic neuron in the NAc through pipette solution during whole-cell recording. A dynamin-derived synthetic peptide (Dyn) prevented NAc LTD expression (Figure 32.4B). Dyn inhibits clathrin-mediated endocytosis by blocking the recruitment of dynamin to clathrin-coated pits39 and prevents expression of certain forms of LTD4,37. These findings support an essential role of clathrin-dependent endocytosis of AMPARs for NAc LTD expression. Figure 32.3. Dansyl-Labeled Tat-GluR23Y Crosses the Blood-Brain Barrier and Enters Neural Tissue Following Systemic Application of the Peptide. Two adult male C57-Black/6 mice were given an intraperitoneal injection of either 30 moles/g dansyl-labeled Tat-GluR23Y or saline. Mice were sacrificed and 40 j coronal cortical sections were cut with a cryostat. Peptide and saline treated brain sections were visualized with fluorescence microscopy. The images above are of the cortex at -1.0 mm with respect to the bregma. The required clathrin-dependent endocytosis process in NAc LTD involves GluR2-dependent endocytosis of postsynaptic AMPARs. A synthetic peptide derived from rat GluR2 carboxyl tail (GluR23Y; 869YKEGYNVYG877) that specifically blocks regulated, but not constitutive, AMPAR endocytosis and the expression of CA1 homosynaptic LTD in hippocampal slices30,40 completely abolished the expression of NAc LTD (Figure 32.4B). These findings support the specific action of GluR23Y peptide in blocking regulated AMPAR endocytosis, and hence the expression of LTD. Figure 32.4. Clathrin- and GluR2-Dependent AMPAR Endocytosis are Required for the Expression of NAc LTD. (A) LTD of EPSCs evoked by electrical stimulation of glutamatergic cortical inputs projected to medium spiny neurons in the NAc can be induced under whole-cell voltage-clamp mode by pairing presynaptic stimulation (1 Hz, 480 pulses) with postsynaptic depolarization. (B) Histogram shows the depression of EPSC at 30 min after pairing stimulation. Inclusion in the patch pipette of interference peptides for blocking clathrin-dependent AMPAR endocytosis (Dyn), but not the control scrambled Dyn form, abolished the formation of LTD. These findings indicate that NAc LTD is mediated by clathrin-dependent endocytosis of AMPARs. NAc LTD also requires GluR2-dependent endocytosis of postsynaptic AMPARs because the application of GluR23Y but not the control GluR23A peptide via recording pipettes inhibited LTD expression. ** p < 0.01 versus control (Tukey-Kramer test). Next, the effects of peptides were tested on behavioral sensitization that was induced in rats with repeated injections of D-amphetamine. The expression of behavioral sensitization was evoked by a challenge dose of D-amphetamine 21 days later. Pretreatment of sensitized rats with intravenous Tat-GluR23Y prior to the challenge dose of D-amphetamine prevented the expression of behavioral sensitization (Figure 32.5A,B; Colorplate 14). Figure 32.5. Interference Tat-GluR23Y Peptide Blocks D-Amphetamine-Induced Behavioral Sensitization. (A) D-amphetamine-sensitized rats (n=6-8/group) were pretreated with Tat-GluR2 3Y, Tat-GluR23A, or saline by i.v. injection (1.5 nM/gr) 90 min prior to a challenge dose of D-amphetamine (2 mg/kg, i.p). Stereotypy scores were measured at 10-min intervals over a 2-hour session. Pretreating D-amphetamine-sensitized rats with Tat-GluR23Y (red diamond), but not Tat-GluR23A (black square), prevented the sensitized behavioral response to a challenge dose of D-amphetamine (blue circle). Tat-GluR23Y abolished only the expression of behavioral sensitization, as it did not affect the response of naive rats to D-amphetamine (green diamond) when compared with saline treated control (white triangle). (B) Histogram shows the summary of changes in stereotypy scores across the 2-hour test session converted to Area Under the Curve (AUC) for individual groups depicted in graph (A). (C) The blockade of behavioral sensitization was reproduced when Tat-GluR23Y (15 pmol; in 0.3 |l) was microinjected directly into the NAc. Injecting peptides into VTA (D) did not affect behavioral sensitization (* p < 0.05 versus acute D-amphetamine group. n = 6-7 in each group). Redrawn from ref. 41. See Colorplate 14. Pretreatment with control Tat-GluR23A or with saline had no effect. Co-administration of Tat-GluR23Y with an acute injection of D-amphetamine did not significantly change stereotypy responses or locomotor scores relative to acute D-amphetamine alone and no noticeable behavioral side effects were associated with peptide pretreatment. 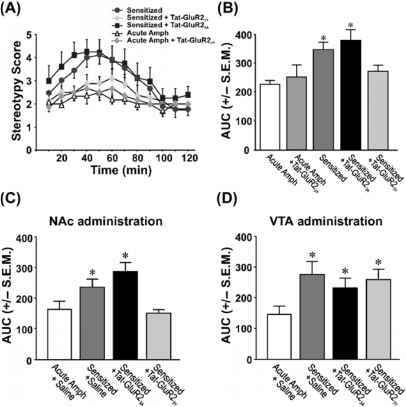 To determine where the systemically applied Tat-GluR23Y peptide was acting to disrupt the expression of behavioral sensitization, the peptide was microinfused directly into the NAc or the VTA. Tat-GluR23Y prevented the expression of behavioral sensitization when it was delivered into the NAc (Figure 32.5C; Colorplate 14) but not into the VTA (Figure 32.5D; Colorplate 14). The effects of Tat-GluR23Y did not appear to represent a general disruption of learned motor behavior as systemic treatment with Tat-GluR23Y failed to disrupt operant responding for food pellets delivered on an FR2 schedule of reinforcement. Responding for intravenous D-amphetamine in a more demanding progressive ratio schedule of reinforcement, in which successive deliveries of drug reward require progressively more operant responses42, was similarly unaffected by treatment with Tat-GluR23Y or Tat-GluR23A41. The GluR23Y peptide inhibited the expression of NAc LTD without affecting basal synaptic transmission and other upstream signaling processes involved in LTD. The membrane-permeant form of GluR23Y peptide made it possible to probe the role of LTD in freely moving rats with unprecedented specificity, providing evidence for the involvement of NAc LTD in the expression of behavioral sensitization. 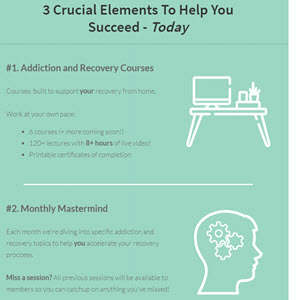 Given the links between behavioral sensitization and enduring drug-induced neuroplasticity, these data raise the possibility that treatment with drugs (such as GluR23Y peptide) that disrupt LTD may form the basis for a rational drug development strategy for treating maladaptive neuroadaptations related to exposure to addictive substances.